I recently critiqued some of the donairs in Calgary, as I don’t believe Calgary to be a great donair city. 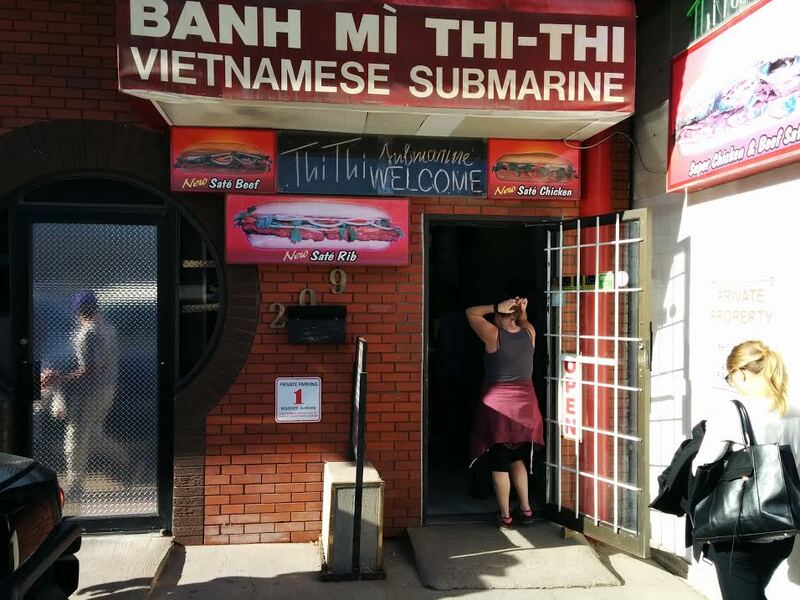 But what Calgary lacks in donair culture they make up for with Vietnamese subs! I would argue that the banh mi is Calgary’s #1 street food – that it is more prevalent here than other cities in Canada and a quintessential food to sample while visiting. Banh mi, or Vietnamese sandwiches, originated in Saigon where Vietnamese baguettes (banh mi) were filled with meats and other ingredients of both French and Vietnamese origin. Baguettes, pâté and mayonnaise join together with Vietnamese ingredients like cilantro, chilies, pickled carrots and daikon. 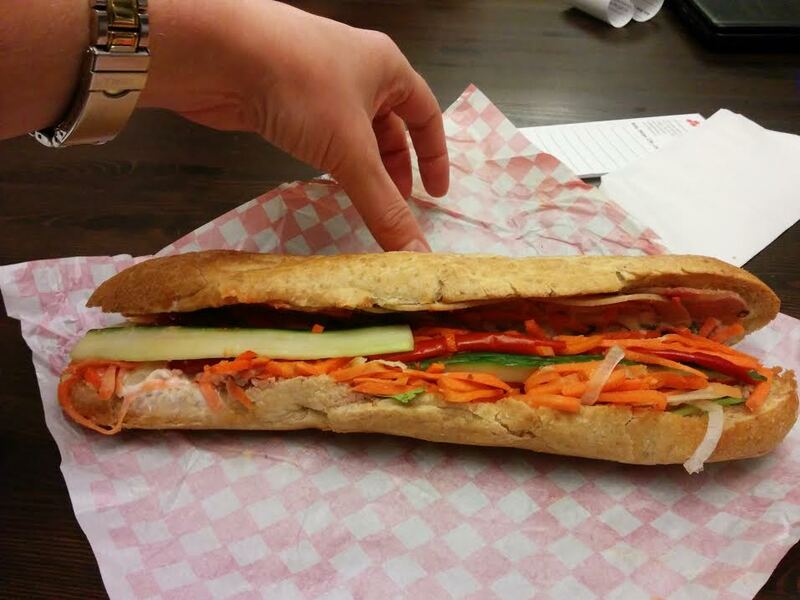 Calgary’s Vietnamese subs vary a bit, but they tend to omit pickled daikon in favour of carrots. Common varieties are: Satay beef or chicken, Assorted (cold cuts), Vietnamese sausage, lemongrass chicken, pork balls, BBQ pork, tofu and veggie. 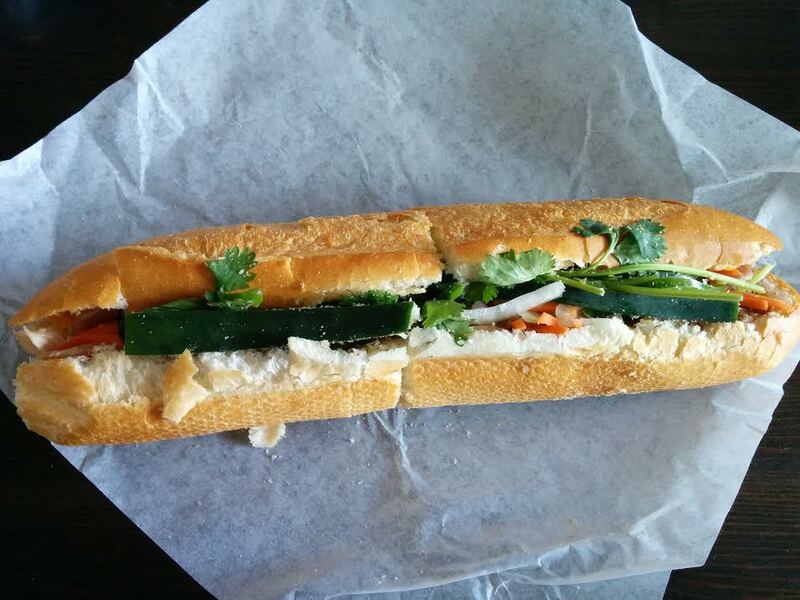 On my latest trip to Calgary I managed to sample 3 banh mi – and I will mention several more that are worth trying. 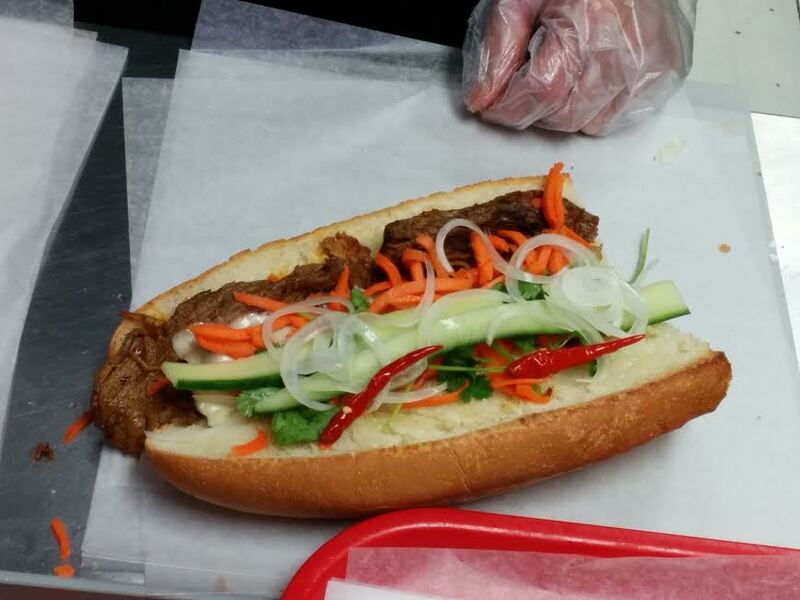 Calgary’s Thi-Thi is widely thought to make the best satay beef subs in town! It’s a clean and tiny shop located in Chinatown across from the Harry Hays building, and you can except a line going out the door. Cash only! This sub had thinly sliced white onions, pickled carrots, cucumber, cilantro, red chilies, mayo, pâté and I think soy sauce? They also put cheese on the subs before toasting, which is a rather Westernized touch, but it seems to work. 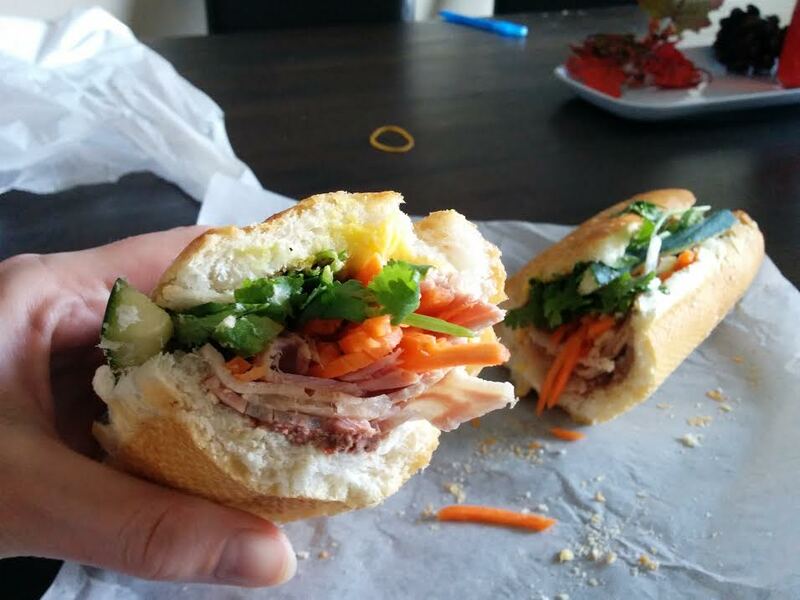 The portion of beef was on the small side, but this is otherwise the perfect Vietnamese sub. The veggies are fresh and vibrant, the flavours dazzling, but most of all, the baguette is perfect. It is crunchy on the outside, soft on the inside in the most perfect way. I had never been to Saigon Deli but had heard it mentioned in a Chowhound thread as a good place to try. When I mentioned to my buddy Tan that I wanted to check it out, he warned me that it was “fatty”. When I walked in the store I noticed a big bowl of orange stuff. “Ooo is that mango pudding?” I asked. “No. That’s lard,” he responded. It’s weird. A lot of the online reviews praise this shop for its “mayo butter sauce” so I’m not sure if it is lard or something else but it kind of grossed me out. I also found the baguettes to be too crispy for my liking. Otherwise this sub was pretty decent. I ordered an assorted cold cut sub, and the cold cuts had some texture to them which to me indicated quality. People tell me that all Vietnamese cold cuts are the same but I don’t believe them. These cold cuts reminded me of the home-made ones I had at the Harbourview Market in Dartmouth. This sub was loaded with meat and vegetables. Cilantro, cucumber, pickled carrots, jalapeno slices and liver pâté were all generous and tasty. Big portions for low prices is what you’ll find at this efficient, family-run shop. Thai Thi (not to be confused with Thi Thi!) is in the midst of the action on 17th Ave and stays open ’til 11:30pm on the weekends – just late enough enough to catch some of the bar crowd with bubble tea, Viet subs and quick Vietnamese food on the menu. These subs are available in white or whole wheat bread and come with your choice of Thai chilies, cilantro, cucumber, onions, carrots, hot sauce and “special Thai sauce”. I find these subs somehow different than the other shops in town. There is no pâté and I’m unsure what’s in the “special Thai sauce” or what the “Thai” aspect of this otherwise Vietnamese restaurant actually is. There are more unusual options like Pineapple Beef, Curry Chicken and Teriyaki Chicken. I picked this up after an evening of craft beer guzzling, and didn’t notice until I got back to my friend’s house that they gave me whole wheat bread. I’m not sure if they were sold out of white or if this was some sort of mistake. The whole wheat bread was very soft, almost Subway-esque. I wish I could comment on the white baguettes to see how they compare to the others I’ve tried. The cold cuts were more sparse and seemed to be of lower quality than those at Saigon Deli. This is fine for a late night grab, but not the best Viet sub I’ve had. This 17th Ave SW shop is one of my favourite spots in Calgary, even though I didn’t get to go there on my last visit (they aren’t open as late as Thai Thi, which is right across the street). They claim to have the best cold cut sub in Calgary. My very last meal in Calgary, as I left the city on a Greyhound bus back in 2012 was a chicken & beef combo from Kim Anh. Ah, memories! 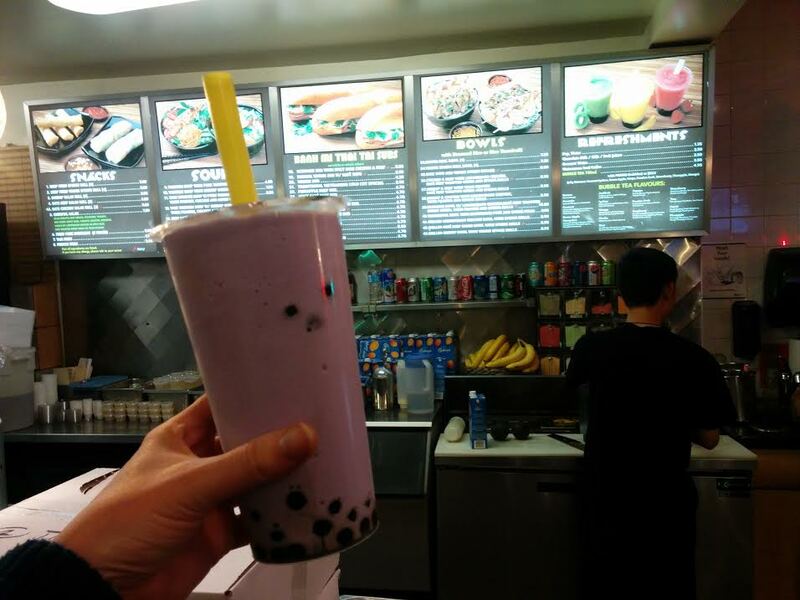 They also serve bubble tea, which I think is the perfect accompaniment to Viet subs. Next time I visit Calgary I think I’ll head to Trung Nguyen, which is located in the Far East Shopping Centre in Chinatown. They apparently offer unusual options like Buffalo Chicken subs, but their more traditional subs get rave reviews. Check out this review from are you gonna eat that? 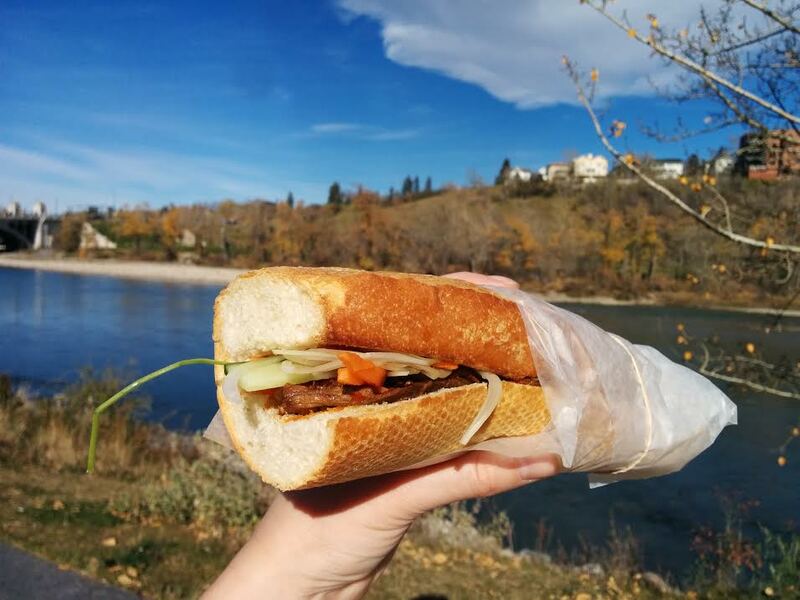 Where is your favourite Vietnamese sub in Calgary? Let me know in the comments below! Food Nerd. Pizza junkie. Burger ambassador. Bean paste enthusiast. Beer drinker. Urban wanderer. Friendly local.